A young war widow who conceals her pain under a frenzy of stateside volunteer work, sparks a romance that flings them both into peril. CBI - China: Day 48 of 154 of the Japanese Invasion of Manchuria. Spain: Day 111 of 985 of the Spanish Civil War. CBI - China: Day 16 of 29 of the 1st Battle of Suiyuan. Spain: Day 476 of 985 of the Spanish Civil War. CBI - China: Day 121 of 2,987 of the 2nd Sino-Japanese War. Day 84 of 106 of the 2nd Battle of Shanghai. Day 65 of 70 of the Battle of Taiyuan. Spain: Day 841 of 985 of the Spanish Civil War. CBI - China: Day 486 of 2,987 of the 2nd Sino-Japanese War. Day 24 of 81 of Japan's Operation GUANGDONG. USA: Although President Roosevelt has declared American neutrality in the war in Europe, a Neutrality Act is signed that allows the US to send arms and other aid to Britain and France. The Neutrality Acts were laws that were passed by the US Congress in the 1930s in response to the growing turmoil in Europe and Asia, which eventually led to World War II. They were spurred by the growth in isolationism and non-interventionism in the US following its costly involvement in World War I, and sought to ensure that the US would not become entangled again in foreign conflicts. The legacy of the Neutrality Acts in the 1930s is widely regarded as having been generally negative: they made no distinction between aggressor and victim, treating both equally as "belligerents" and they limited the US government's ability to aid Britain and France against Nazi Germany. On 04 Nov 39 the Neutrality Act of 1939 was passed, allowing for arms trade with belligerent nations on a cash-and-carry basis, thus in effect ending the arms embargo. Furthermore, the Neutrality Acts of 1935 and 1937 were repealed. 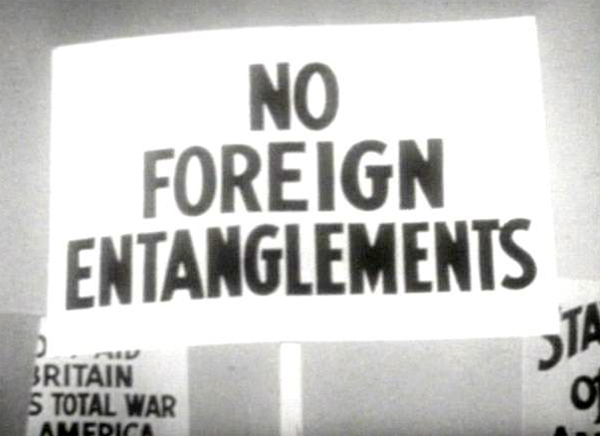 The end of neutrality policy came with the Lend-Lease Act of March 1941, which allowed the US to sell, lend or give war materials to nations the administration wanted to support. UK: Rear-Admiral Hugh Sinclair, head of British Secret Intelligence Service (MI6), dies of cancer and is succeeded by his deputy, Colonel Stewart Menzies. CBI - China: Day 851 of 2,987 of the 2nd Sino-Japanese War. ETO - UK: Day 60 of 258 of the Blitz. East Africa: Day 148 of 537 of Italy's East African campaign in the lands south of Egypt. CBI - China: Day 1,217 of 2,987 of the 2nd Sino-Japanese War. Day 356 of 381 of the Battle of South Guangxi. CBI - Thailand: Day 35 of 221 of the Franco-Thai War (Vichy France vs Thailand). Russian Front - Finland: Day 129 of 142 of Operation SILVER FOX, a joint German-Finnish campaign to capture the Russian port of Murmansk in the Arctic. Russian Front - Finland: Day 127 of 140 of Operation ARCTIC FOX, a joint German-Finnish campaign against Soviet Northern Front defenses at Salla, Finland. Russian Front - Finland: Day 136 of 164 of the Battle of Hanko. The Soviets will be forced off their leased naval base. Finnish troops capture the Baltic naval base of Hangö that Finland was compelled to lease to the Soviets in 1940. Russian Front: Day 136 of 167 of Germany's Operation BARBAROSSA. Russian Front - North: Day 58 of 872 of the Siege of Leningrad. Russian Front - Center: Day 34 of 98 of the Battle of Moscow. Russian Front - South: Day 6 of 248 of the Siege of Sevastopol, Crimean Peninsula. Units of German 11th Army capture Feodosiya. MTO - Libya: Day 209 of 256 of the Siege of Tobruk. East Africa: Day 513 of 537 of Italy's East African campaign in the lands south of Egypt. CBI - China: Day 1,582 of 2,987 of the 2nd Sino-Japanese War. Russian Front - North: Day 423 of 872 of the Siege of Leningrad. Russian Front - North: Day 184 of 658 of the Siege of the Kholm Pocket, USSR lays siege to the Kholm Pocket but the Germans hold out for a about a year and a half. Russian Front - South: Day 130 of 150 of Germany's CASE BLUE, the failed offensive to take the Caucasus oil fields. Russian Front - South: Day 74 of 165 of the Battle of Stalingrad, bloodiest battle in human history. MTO - Egypt: Day 13 of 20 of the 2nd Battle of El Alamein. The Italian 20th Motorized Corps is destroyed. Rommel re-issues his orders for retreat with only 12 tanks left. 10,724 Axis prisoners are taken by the British, including nine generals. US B-25s and P-40s provide air support. East Africa: Day 184 of 186 of the Battle of Madagascar. CBI - China: Day 1,947 of 2,987 of the 2nd Sino-Japanese War. PTO - Alaska: Day 151 of 435 of the Battle of Kiska, Aleutian Islands. The US and Canada will defeat the Japanese invaders. PTO - Malaya: Day 259 of 357 of the Battle of Timor Island, a long guerrilla war ending in Japanese victory. PTO - New Guinea: Day 107 of 119 of the Battle of the Kokoda Track. The Australians continue pushing back the Japanese troops. PTO - Solomon Islands: Day 90 of 187 of the Battle of Guadalcanal. Russian Front - North: Day 788 of 872 of the Siege of Leningrad. Russian Front - North: Day 549 of 658 of the Siege of the Kholm Pocket. USSR lays siege to the Kholm Pocket but the Germans hold out for a about a year and a half. Russian Front - South: Day 73 of 122 of the Battle of the Lower Dnieper River, USSR. The Soviets achieve a breakout north of Kiev with their tanks driving throughout the night. Russian Front - South: Day 2 of 10 of the 2nd Battle of Kiev, Ukraine. MTO - Italy: US 5th Army captures Isernia, 50 miles north of Naples, and links up with British 8th Army moving North West from Foggia. US 12th Air Force provides air support. MTO - Italy: US 15th Air Force B-17s bomb targets between Montalto di Castro and Orbetello, Orbetello and Talamone, and San Vincenzo and Cecina. CBI - China: Day 2,312 of 2,987 of the 2nd Sino-Japanese War. Day 3 of 49 of the Battle of West Changde. PTO - New Guinea: Day 47 of 219 of the Battle of Shaggy Ridge. PTO - New Guinea: Day 44 of 162 of the Battle of the Huon Peninsula. PTO - New Guinea: Day 3 of 10 of the Bombing of Rabaul, a joint US, Australian and New Zealand carrier and land-based attack on the Japanese cruiser force at the naval base at New Britain. PTO - Solomon Islands: Day 4 of 295 of the Battle of the Bougainville Islands. ETO - France: Day 96 of 284 of the Battle of Brittany. ETO - Belgium: Day 34 of 38 of the Battle of the Scheldt Estuary. ETO - France: Day 51 of 236 of the Siege of Dunkirk. ETO - Germany: Day 47 of 145 of the Battle of Hürtgen Forest. ETO - Germany: US 8th Air Force sends up 1,160 heavy bombers and 890 fighters to bomb oil industrial targets in western Germany. Russian Front - Finland: Day 51 of 223 of the Lapland War. Finland and Russia have joined forces to kick the Germans out of Finland's most northern province. Russian Front - Center: Day 21 of 206 of the Battle of the Courland Pocket in Latvia. Russian Front - Center: Day 14 of 99 of the Siege of Memel, a border town of Lithuania and East Prussia. Russian Front - Center: Day 52 of 72 of the Battle into East Prussia and northern Poland. Russian Front - South: Day 7 of 108 of the Battle of Budapest, Hungary. Russian Front - South: Day 52 of 72 of the Battle of Belgrade, Yugoslavia. MTO: US 15th Air Force heavy bombers hit targets in Germany, Austria, and Yugoslavia. MTO - Italy: US 12th Air Force medium bombers attack a number of railroads. CBI - Burma: Day 218 of 302 of the Chinese Salween Offensive in Burma. CBI - China: Day 2,678 of 2,987 of the 2nd Sino-Japanese War. Day 202 of 259 of Japan's Operation ICHI-GO. PTO - New Guinea: Day 197 of 481 of the Battle of Western New Guinea. PTO - Palau Islands: Day 51 of 74 of the Battle of Peleliu (Operation STALEMATE II). PTO - Philippines: Day 16 of 299 of the 2nd Battle of the Philippines, aka the Liberation of the Philippines or the Philippines Campaign. PTO - Philippines: Day 16 of 73 of the Battle of Leyte.